High-rise king Harry Triguboff has unveiled plans for his first beachfront tower in a 54-year development career – an eye-catching 73-level super-tower close to the heart of Surfers Paradise. The tower, Ocean, will not be the tourist capital’s tallest building but it will be the biggest – it will have nearly 200 more apartments than fellow super-tower Q1. The 722 apartments in Ocean, which is designed to be in harmony with the sea, will include 319 operating as serviced apartments under Mr Triguboff’s Meriton Suites brand and five penthouses. 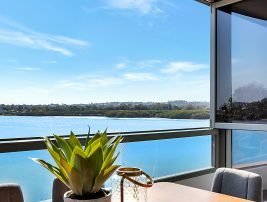 Ocean, at 84 The Esplanade, will be the 84-year-old Mr Triguboff’s 19th Gold Coast high-rise and he says, given a pre-emptive surging wave of inquiry from buyers, he expects it to be by far his most successful. “The Gold Coast is the flavour of Australia in property terms,” he said yesterday. Mr Triguboff said he intended Ocean to be a vibrant building – ‘almost a self-contained community’. 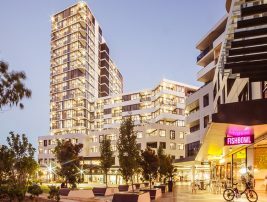 Ocean, designed by Meriton in tandem with Sydney’s SJB group, is to rise on a 3833sqm site at 84 The Esplanade that backs on to the Gold Coast Highway. Mr Triguboff’s Meriton group paid $58 million in March for the International Beach Resort, a 22-level tower north of Cavill Ave that was built in the late 60s and originally was known as the Apollo. Demolition of the tower has been completed and Meriton hopes to have Ocean under way by March. It will rank No.3 on the Gold Coast in terms of floors – Soul has 77 and Q1 74. Mr Triguboff yesterday said Ocean’s design encapsulated all that was great about one of the world’s standout beachfront locations. “Arriving at the final design has been quite an adventure for me. “I have been passionate about delivering a building that is in tune with the ocean and the golden beach that fronts it. “Getting there hasn’t been smooth sailing. “The end result has involved months of changes and refinements, along with consultation with the city council. “I believe Ocean will bring a new dimension to the beachfront strip in the form of a sculptured tower that uses materials and finishes inspired by the ebb and flow of the ocean. “Even Ocean’s podium will have the sea look – it will reflect the ripples and fluting the ocean carves into the seabed. Ocean will have three levels of basement and the tower will sit on a five-level podium, with the top level housing a recreation area that will include a pool, spa, fitness courtyard, and barbecue area. A residents’ indoor pool will be included on level 32. Mr Triguboff’s first Gold Coast towers were Florida in Surfers Paradise and the Nelson at Paradise Waters at the start of the 80s. He built three high-rises — Xanadu (two) in the late 90s and Pacific Views in 2002 — on the western side of Main Beach Pde that overlook the ocean but are separated from the sand by beachfront properties.